Guardians Of The Galaxy was a blast of fun and a big hit for Marvel, so it’s no surprise the oddball band of heroes are back for another go around, this time bringing movie legends Kurt Russell and Sylvester Stallone with them. The film opens with The Guardians saving the day for a race called The Sovereign, but getting on their bad side before the dust even settles. This sets them on the run and into the sights of a celestial being called Ego (Kurt Russell) who claims to be Peter Quill’s (Chris Pratt) father. Peter finds out he may have celestial powers of his own, but the more he bonds with his newfound father, the more Gamora (Zoe Saldana) and Drax (Dave Bautista) feel that daddy isn’t to be trusted. 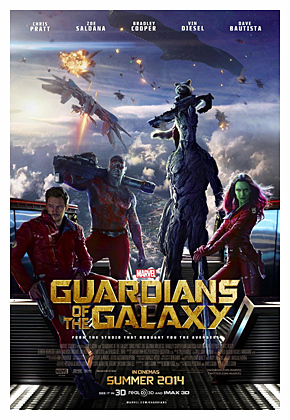 In the meantime, Rocket (voiced by Bradley Cooper), Yondu (Michael Rooker) and “baby” Groot (voiced by Vin Diesel) have to deal with mutinous Ravagers, angry Sovereigns and a vengeful Nebula (Karen Gillan). Second adventure is an entertaining ride, thought not quite as much rapid-fire fun as it’s predecessor. Sequel is again written and directed by James Gunn, who returns with his quirky, sarcastic sense of humor that made the first flick stand out in the Marvel Cinematic Universe. After a first film sometimes moved too fast, this film dials it back during it’s middle act to take time to allow Peter and Ego to bond and along the way deliver some backstory on more than one character. While father and son take long walks on Ego’s self-made world, Raccoon and Yondu also have some bonding moments as Ravager prisoners, where souls are bared and alliances made. It’s certainly not boring, but it does take a bit more time for the action to fire up again while we get some character development for characters both old and new. Ironically, the first film rushed the character development while this one makes it more the focus….maybe slightly too much for it’s own good at over 136 minutes. Once we discover daddy is a baddy and our displaced heroes reunite, then we get a spectacular and action packed finale that amusingly evokes the climax of Star Trek V: The Final Frontier, but with far better FX and a lot more fun. The before mentioned visuals and FX are truly stunning and the action is quite exhilarating once it comes and it comes in spades. There are some hilariously funny bits and some very funny exchanges between the characters, who still have that twisted love/hate relationship with each other. When the group is split into two separate plot lines, the film doesn’t quite have the same spark as when this bunch of self proclaimed “A-holes” are all together trying not to kill each other, or be killed. If there is a flaw with this worthy sequel, it is that it does disrupt the group chemistry by separating them for almost an hour. The film is at it’s most fun when they are all together and joined by new characters, like Pom Klementieff’s empathetic and naive Mantis and Sylvester Stallone’s veteran Ravager Stakar, who fit in quite well to the mythos. The film also has a touch more sentimental than we would expect from this delinquent group. It’s a bit corny at times, but it serves to cement the dysfunctional family unit that they are. This bunch is together for a reason…and they’re accompanied by another killer soundtrack of classic tunes! The cast are all on point. Returning actors slip back into their now beloved characters flawlessly and as per the story, get to add a little depth to their roles, including the CGI Rocket and scene stealing baby Groot. The actors have a chemistry together and thus do the characters they bring to life. As for new faces, Kurt Russell is charming and charismatic as Ego. We almost believe, as does Quill, that he is the benevolent being he claims, looking finally to be a father to his estranged son. Once he reveals his true nature, Russell chews the scenery in just the right measures of megalomania. Sylvester Stallone also fits into the Guardian’s world well as a legendary Ravager named Stakar Ogord. He only has a few scenes but it is implied we haven’t seen the last of him and it’s nice to see Sly doing his larger than life thing in the Marvel universe. Adorable Pom Klementieff steals scenes as the delightfully ditzy empath called Mantis. She’s a fun and very likable character and never lets her performance go too over-the-top so that she becomes annoying. She fits in nicely and has some very funny scenes with Bautista’s all too literal Drax. The large cast of supporting and secondary characters also shine when they get their moments, too, such as Chris Sullivan’s boorish Taserface and a returning Sean Gunn as Rondu’s right hand, Kraglin. A solid cast with the usual funny cameo by you-know-who! Overall, this was a fun adventure and a worthy sequel. It did slow down the pace down a bit for a more character driven middle act and may have had one too many sentimental moments for it’s own good, but there is still plenty of eye-popping special effects, hilariously sarcastic moments, rapid-fire action and some sumptuously rendered alien creatures and world’s. We get some of the character development that was a bit lacking in the first film, though do sacrifice some of that great group chemistry and dialog exchanges when the story chooses to separate them. Still highly recommended for fans of the original and a solid start to the summer 2017 movie season. …oh…and, obviously stay through the fun credits for FIVE additional scenes! 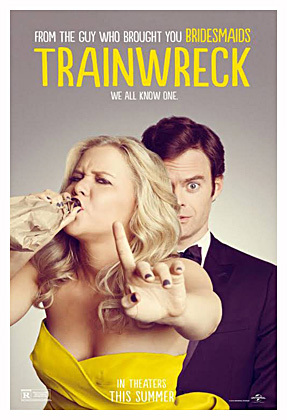 Trainwreck is a bit of a return to form for director Judd Apatow, who hasn’t made a really funny movie since Knocked Up. Film tells the story of Amy (Amy Schumer, who also wrote) a party girl who uses her wild ways to avoid getting truly close to anyone. That is until a writing assignment (Why do all these movies feature lead’s who work for magazines?) introduces her to dorky sports doctor Aaron Conners (Bill Hader). Now faced with possible true love, will Amy’s self destructive behavior ruin the best thing that’s ever happened to her? Obviously, a big factor in why this routinely plotted romantic comedy works is it’s feisty, funny leading lady and the cast she is surrounded with. Schumer’s script is also legitimately funny and not only has some laugh out loud moments, but has some actual wit behind the more vulgar humor…a condom story Amy tells at a baby shower is particularly hysterical. She and Bill Hader have an off-beat chemistry and helps keep us engaged even as the move is about 15 minutes too long and gets a bit too sentimental for it’s own good. Also stars Brie Larson, Colin Quinn, Tilda Swinton and some surprisingly funny appearances by WWE Superstar John Cena, as a muscle-head Amy’s dating and a scene stealing LeBron James as himself. Written and directed by Cameron Crowe, who has given us more than one classic, this flick has quite an engaging cast and might have been a good movie, if it ever decided what it was about. Is it about military contractor Brian Gilcrest (Bradley Cooper) helping billionaire entrepreneur Carson Welch (Bill Murray) get his communications satellite in orbit?…Is it about Gilcrest trying to uncover what’s in the satellite’s secret payload?…Is it about Gilcrest trying to win back former flame Tracy (Rachel McAdams) who’s in a troubled marriage?…Is it about Gilcrest falling in love with the military aide (Emma Stone) acting as his Hawaiian liaison?…or is it about Gilcrest discovering the daughter (Danielle Rose Russell) he never knew he had?…we don’t know and neither does the movie! Add in some rambling dialogue sequences that go on and go nowhere and you have a waste of 105 minutes and a very solid cast…not to mention beautiful Hawaiian locations. Also stars, Alec Baldwin and Danny McBride as military officers. An oddly schizophrenic screenplay and very haphazard direction from a filmmaker who can direct stuff like this in his sleep…and maybe this time he did! Clint Eastwood’s biographical movie about Navy S.E.A.L. sniper Chris Kyle is a well made enough film but, never really drew me in. To a degree it’s a by-the-numbers bio-drama, despite some intense action, set during the post 911 Iraqi conflict. The scenes of Kyle’s time in the Middle East, where he racked up an impressive 160 kills, were engaging but, it’s the sporadic scenes at home while he suffers the effects of his time in combat that fall flat and seem very routine, drama-wise. 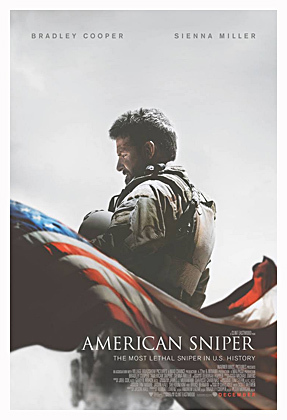 Bradley Cooper is solid though, not overly impressive as Kyle and the film downplays the biggest irony of the war hero’s life, that he was killed at home by another war veteran also suffering from the post-war effects of his time in combat. The most interesting and tragic part of Kyle’s tale is left to a pre-credits footnote in Jason Hall’s script despite being one of the most important events of this true story. Certainly not a bad move, but, also far from the great film hype has proclaimed it to be. I enjoyed the fact based Lone Survivor a lot more. Also stars Sienna Miller in a stereotypical portrayal of the ‘long suffering wife’ as Taya Renae Kyle. Nils Timm’s supernatural thriller is a dull film with a plot seen far too often to count. 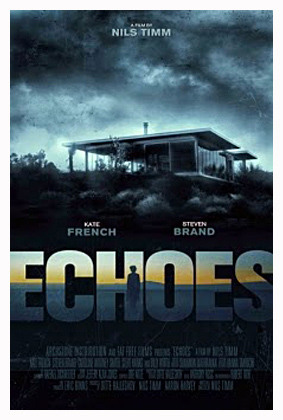 Pretty script writer Anna (Kate French) is suffering from nightmares and goes out to her manager/boyfriend’s (Steven Brand) desert retreat to finish her work. Obviously, strange things start to occur and Anna begins to see things and exhibit some odd behavior. Is it a product of her intense night terrors and emotional troubles or is there something else in the house with her? Gee, I wonder which it is? (insert large amounts of sarcasm). We’ve seen the mentally troubled person in the isolated setting far too many times and Timm does nothing new or inventive with it. This is strictly by-the-numbers stuff and comes to a very predictable conclusion. What little spookiness it tries to evoke is, at times, sunk by some awful CGI. The dog was cute but, we all know what happens to pets in these flicks. Boring and routine. I’d never even heard of Guardians Of The Galaxy till Marvel announced a film version of the comic. So, I went into this flick blind though, I am a big fan of director James Gunn’s Slither and was familiar with his devious and sarcastic sense of humor. And while I do feel some familiarity with the comic would help a little going in, I had a blast of a good time nonetheless. 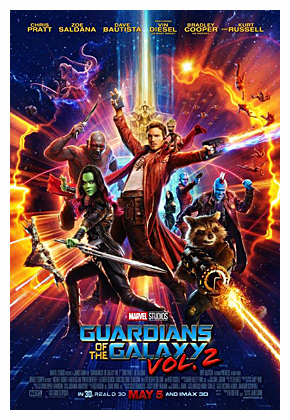 The film opens with a young boy, Peter Quill being abducted from Earth by a space ship and then fast forwards 26 years later with Quill (Chris Pratt) now a renown thief who calls himself Star Lord and runs with a group of space pirates know as the Ravagers. He steals a mysterious orb which is also on the wanted list of a vicious Kree usurper called Ronan The Accuser (Lee Pace) and when he tries to sell it without involving the Ravager’s leader Yondru (Michael Rooker), he also earns a price on his head. And when he collides with Ronan’s assassin Gamora (Zoe Saldana) and bounty hunters Rocket Racoon (Bradley Cooper) and the plant-like Groot (Vin Diesel) all four land in jail. It is there they bond over common issues and enemies and hook up with their eventual 5th member Drax (WWE Superstar Dave Bautista) and the Guardians Of The Galaxy are born! Now they must escape from prison and somehow keep the orb out of Ronan’s hands as he seeks to use it’s powerful contents to lay waste to anyone who stands in his way, including the Nova Corp home world of Xandar and even the powerful Thanos (Josh Brolin) himself. Yea, Guardians is a little plot heavy but, makes it work in just over two hours. One of the few flaws I had with it was, that the plot is a little complex in terms of characters, which there are a lot of, and backstory, which is kinda rushed through in quick exposition sequences. The first half hour is a bit clunky as we have five main characters and two or three villains to introduce us to and the flick tries to get this origin stuff out of the way as quick as possible to get the story moving. And this first segment is a bit too fast paced for it’s own good. But, once the heroes bond inside the Nova Corp prison and form a misfit group with a mission, the flick accelerates into a incredibly fun, and hysterically funny at times, sci-fi adventure that is one of this Summer’s best movies and one of the most outright entertaining movies Marvel has put out since The Avengers. Director and co-writer, with Nicole Perlman, James Gunn has shown us his audacious, mischievous and deviously sarcastic sense of humor in his previous films and here he delivers some really funny lines and scenes that test the boundaries of Marvel’s PG-13 movie universe while not disrupting the dazzling and action packed space opera going on around it. He keeps the film moving like a rocket, though a little too fast at first as said, and there are some truly dazzling action and battle scenes throughout. And the best thing of all, is the film also has some nice emotional resonance to go along with the one-liners and space battles and the film has a huge heart to go along with all the CGI wizardry. The characters fast become very endearing and the villains are strong and help add weight to the story. There are dozens of bizarre and unique characters that populate Gunn’s vision of the Guardian universe and the production design reminded me of the classic Heavy Metal comics when it was in it’s glory with artists like Moebius. I really loved the look of the film and the FX were flawless and amazing. Top that off with another strong score by Tyler Bates supported with a great assortment of classic tunes and you have a real blast of a movie with a refreshingly mischievous and rebellious edge to add contrast to the other Marvel films in this ongoing series. There is a large cast and all of them do good work at bringing their colorful and offbeat characters to life. Pratt makes a strong ‘bad boy’ hero and is a nice addition to Marvel’s canon and is nicely flawed reminding one of a less genius and far less polished Tony Stark. Saldana is a strong and passionate Gamora and has a nice chemistry with Pratt and the others. Bradley Cooper steals the show as the voice of Rocket Raccon and he has some of the film’s best lines and delivers them with some deft comic timing. Diesel’s Groot has only one line the tree creature can utter and gets the point across and adds a little different tone and inference to that line each time he says it. Rounding out our heroes is a surprisingly very funny Dave Bautista. The WWE Superstar gives some hilariously dry line readings as well as creates a very noble and imposing warrior in Drax. He shows much more range then some of his other roles. As for the rest, Pace makes a very threatening villain in Ronan, Karen Gillan made a strong villainess in his assassin assistant Nebula and Rooker is top notch, as always, as the out for himself Yondu. Add to that, eccentric character appearances by Benicio del Toro, John C. Reilly and Glen Close and you have a deep cast that really make the offbeat characters come vividly to life whether it is a large role or little more then a cameo… and let’s not forget Josh Brolin giving a lot of weight to Thanos, who is to play a far larger role in future Marvel films. To finish up, I had a blast with one of the most audaciously fun and uniquely toned and designed space operas in some time. It’s a refreshingly different entry in the Marvel film series but, somehow fits right in. It starts off a little awkwardly with a lot of backstory and characters to establish but, ones it gets going it’s a roller coaster ride of sci-fi action and fun, that isn’t afraid to test the boundaries of Marvels family friendly movies. 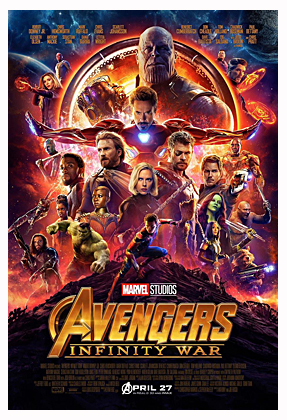 A real blast and probably the most fun I’ve had in a movie since The Avengers… and not to mention a dynamite soundtrack of classic tunes that are perfectly used and placed throughout. Highly recommended! … and, obviously stay through the credits! 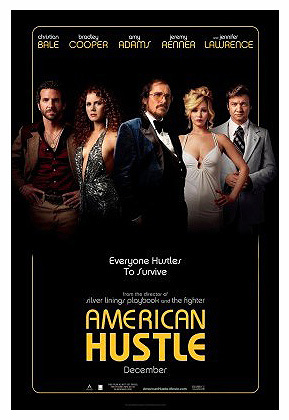 American Hustle is the new film from Silver Linings Playbook director David O. Russell that he co-wrote along with Eric Warren Singer based on Singer’s original screenplay. It uses the infamous ABSCAM sting operation of the late 70s as a basis for the fictional story of con-man extraordinaire Irving Rosenfeld (Christian Bale) and his lover/partner Sydney Prosser (Amy Adams) who have a fake loan operation set up where they charge customers, who are too risky for the banks, an un-refundable $5,000 fee to get them approved for loans that they never actually get approved for. Despite Irving’s unease, Sydney accepts a fee from Richard DiMaso (Bradley Cooper) who turns out to be an ambitious FBI agent. But, Dimaso is out for far larger prey and forces Irving and Sydney to set up a con to catch bigger criminals in order to earn Sydney’s freedom. The deal is to catch 4 criminals and they are free but, Irving cooks up a scheme to catch all 4 crooks at once and soon they are on the trail of the mayor of Camden, N.J. Carmine Polito (Jeremy Renner) and a bunch of US Congressman in a scam involving funding the rebuilding of Atlantic City as a gambling mecca with money from a fictional Arab Sheik (Michael Peña) and the bribes these men give/accept to set it in motion. But, Irving may have gotten himself in over his head as the more corrupt officials and criminals DiMaso thinks he can catch, the bigger the con gets and the more people it involves, such as Rosenfeld’s emotionally troubled wife Rosalyn (Jennifer Lawrence) and dangerous mob boss Victor Tellegio (a cameo I won’t spoil here). And the more people that get involved, the more relationships get entangled and the more complicated things get till the whole thing threatens to come down on Irving’s head. Like Silver Linings, Russell takes a serious toned story and fills it with a lot of sly humor and a large cast of eccentric, multi-layered characters… and despite the clever story, it is the characters that really charge this enormously entertaining and smart flick. He creates a large group of very real people who all have various reasons and motivations for doing what they do. Each character is manipulating others for their own purposes and Russell gives his great cast some really complex, colorful and yet very human characters for his actors to bring to life. And it is the life these actors bring under Russell’s guidance that elevates a really good movie to near brilliance. Christian Bale has given some simply great performances in his career ever since getting everyone’s attention at the age of 12 in Steven Spielberg’s Empire Of The Sun and he simply takes it to another level with his brilliant… and I don’t use that word often… performance as the con man who’s gotten involved in a con even he might not be able to pull off. Amy Adams is equally brilliant as Sydney, Irving’s lover and a woman who might even be better then he at the con game as she too gets caught up in the increasing size of the sting in order to keep herself out of prison. 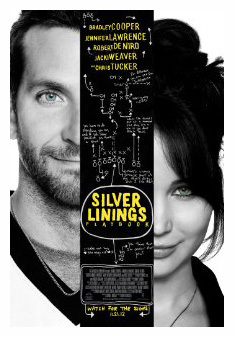 Jennifer Lawrence gives another Oscar worthy performance as Irving’s unbalanced and unpredictable wife who gets drawn into the con but, with her own agenda. Cooper once again shows some amazing growth as an actor and creates a portrait of a man ironically getting greedy when it comes with catching the greedy. His FBI agent is ambitious and relentless and his disregard for playing by the rules seems to increasingly blur the line between himself and those he’s trying to catch. Jeremy Renner finally gets a role worthy of the acting ability he showed in The Hurt Locker and The Town as Camden Mayor Polito, a man who truly believes he’s doing what’s best for the people even if it includes backdoor deals and payoffs. His sincere belief that he is doing what’s right and his genuine likability causes a confusion in Irving that could sabotage everything. And that’s another thing that elevates this film from being a routine thriller… and this flick is far from routine… is the complications that arise from the relationships that form between various members of the scenario such as Irving and Carmine, Richard and Sydney and Rosalyn and a mob enforcer. The game becomes so real and people get so involved in their roles that emotions flow and relationships form… or do they?… this is a con game after all. And that’s what makes this such an entertaining movie as you believe in the character relationships portrayed by the top notch cast and yet, you’re not completely sure if it’s not part of the game. And that is part of the fun. All I will tell you is that it’s a real treat to watch this great cast pull the wool over each other’s eyes, manipulate each other and you, the audience as well. And if all that doesn’t convince you, all the great 70s nostalgia and music, ads perfect atmosphere to the whole film. The music in particular is like another character and the songs placed perfectly. I can never hear Wings’ Live And Let Die again without thinking of Jennifer Lawrence. Altogether this is a wildly entertaining and intelligently written flick with a tour de force performance from it’s entire cast. Sure there are a few slow spots but, everything else is such a delight, one can forgive a few moments to catch their breath. 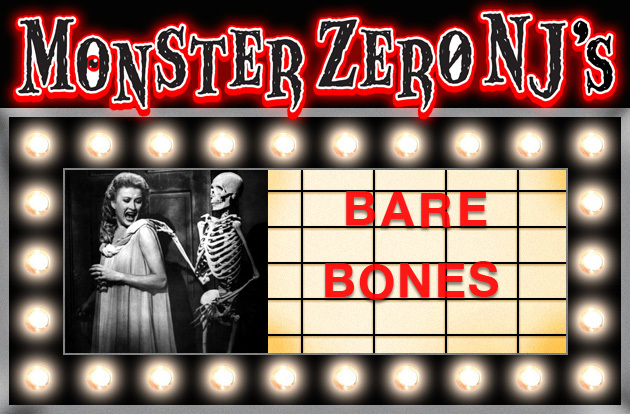 A real treat especially if you are worn out by superheroes, Hobbits and over abundant CGI and are looking for some more substantial to enjoy with your popcorn. A blast from David O. Russell! 4 stars… doing some of their best work!